Which body do YOU prefer? It's New Year and I'm guessing most of us have put on a few extra pounds ... so wondering what most of us prefer when it comes to bodies? I'm not so sure that any of these do it for me, where's all the man hair gone?! I am with Mark Bryant here, man needs to hairy and rugged not all done up like a prize bull. Definitely the "Peter Pan" (skinny or the model perfect body) look is not really appealing either. Hey now. I resent that statement. I have kallmann sydrome and I basically AM like peter pan. A 19 year old stuck in a 11 year old body. So think before you call names next time. His statement isn't directed at you Andy; all he's doing is saying that skinny guys don't appeal to him. For me personally, I'd go for a guy with a swimmer's build. 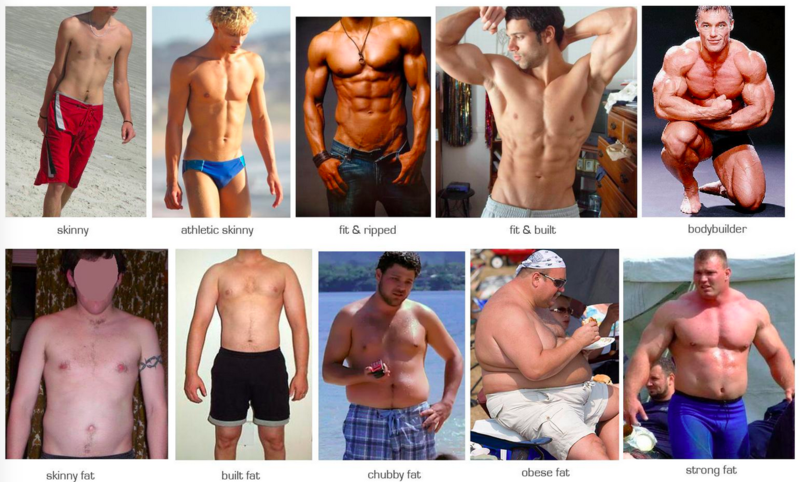 Judging by the photos, I think it would be between the athletic skinny guy and the fit and built guy. Thank you John_Thain... Andy_Tenma I would never direct a statement toward anybody that was in any way a derogatory tone. I was just answering the the question that was asked. If my answer annoys/offends you or anyone else I apologise, but I or anyone posting should not have to apologise for opinions voiced. Actually, the more I look at the photos, I feel more drawn to the fit and built guy. All that's missing for me is the cute face. What kind of man do u prefer? Are you into team sports, or do you prefer a solitary sport?